The Libro Amarillo, or Yellow Book, is a bound volume containing 266 pages (including the cover). 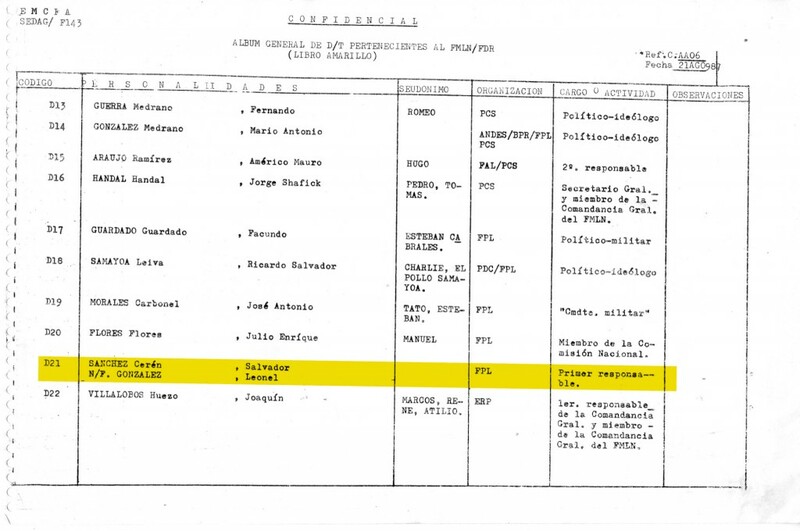 The bulk of the document comprises a list of 1,915 entries on targeted persons, 1,857 identified by name, accompanied by a photograph and key information about their presumed affiliations to leftist political or revolutionary organizations. It is important to highlight that the information cited in the Yellow Book may not be an accurate characterization of profiled individuals. Despite its cover date, the book contains information on people reported killed or disappeared as early as the 1970s, and pages dated as recently as August 1987, indicating that it was a working document likely compiled with intelligence gathered over the course of years rather than a final report. 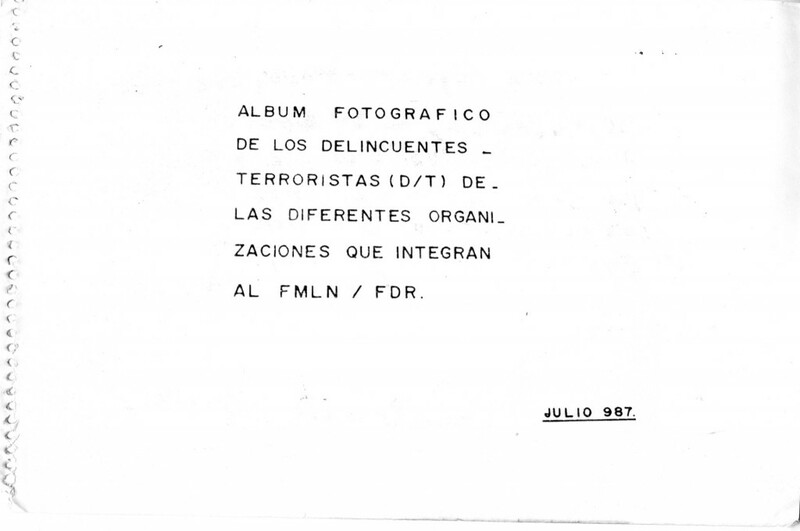 The first page of the Yellow Book is subtitled “PHOTO ALBUM OF THE DELINQUENTS – TERRORISTS (D/T) OF THE DIFFERENT ORGANIZATIONS THAT FORM THE FMLN / FDR”. The Yellow Book begins with a 2 page introduction dated August 1987, outlining the structure and usage guidelines for the document. 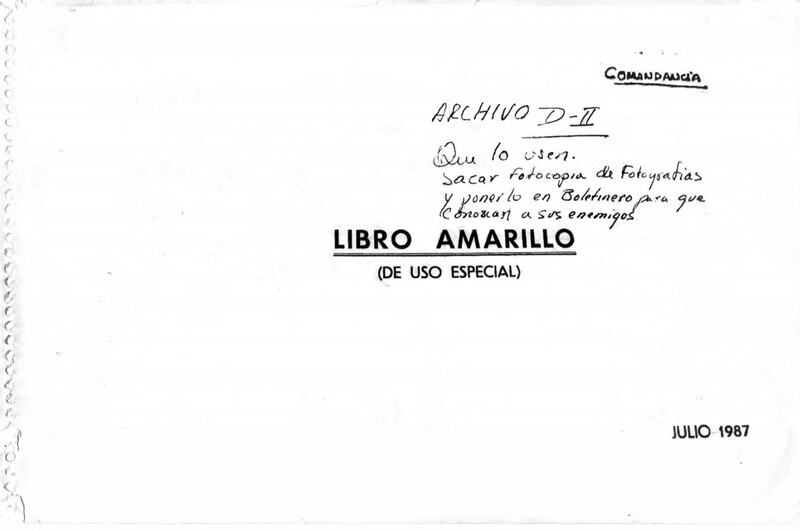 Consistent with the handwritten note on the cover of this copy, the introduction states that the book served to aid the classification and surveillance of suspected subversives by Salvadoran military intelligence. Click here for more on the Yellow Book and military intelligence. The 4-page glossary lists some of the acronyms used in the Yellow Book, including abbreviations of common terms as well the names of targeted organizations, ranging from armed revolutionary groups to civil society organizations. Click here for a translated transcription of the Yellow Book Glossary. Phase A lists 46 high ranking members of various leftist and revolutionary organizations classified by an internal alphanumeric code, with names, pseudonyms, organizational affiliation and identifying data, followed by pages with photographs corresponding to the code. 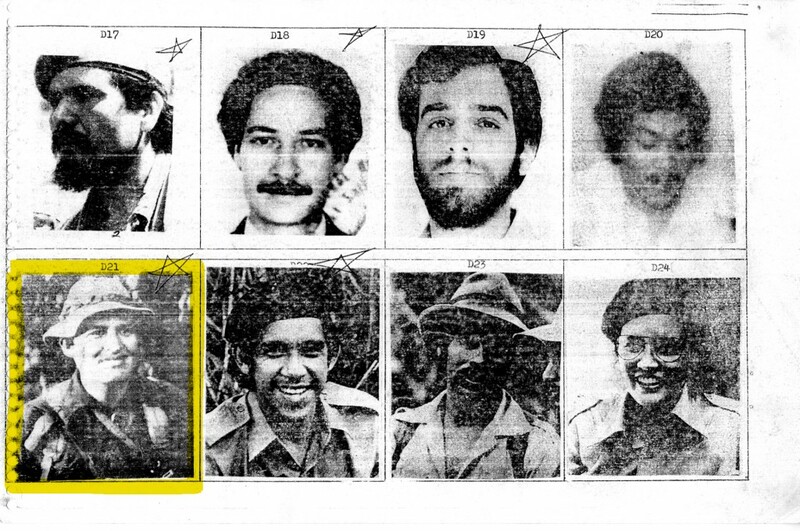 Eight photos are marked with handwritten stars, including that of Salvador Sánchez Cerén, former FPL commander and current President of El Salvador, listed as D21. The entirety of Phase A is dated August 1987. The most common organizational affiliations cited in Phase A are, in descending order: PCS (13 citations), ERP (11), FARN (9), RN (9), FPL (6), PRTC (6), and FDR (5). In addition to guerrilla and revolutionary organizations incorporated in or allied with the FMLN, Phase A also cites civil society affiliations including academic, professional, and political associations. Phase A is the only section of the book which cites targets’ membership in the Christian Democratic Party (PDC, 2 citations). Phase B comprises the bulk of the Yellow Book, 230 pages listing 1,782 “rank and file” “personalities”, each classified by an internal alphanumeric code, names, pseudonym, organizational affiliation, role or activity, and other “observations”; followed by pages with corresponding photographs. As noted in the introduction to the document, the coding is “open, to facilitate additions or updates,” with the alphabetization of the numerical list within each letter periodically restarting. Within each letter’s section there are a maximum of 3 alphabetizations, suggesting that the present copy of the book was updated at least two times after its initial creation. A number of individuals are listed multiple times; it is unknown whether this is intentional or reflects errors in record-keeping. 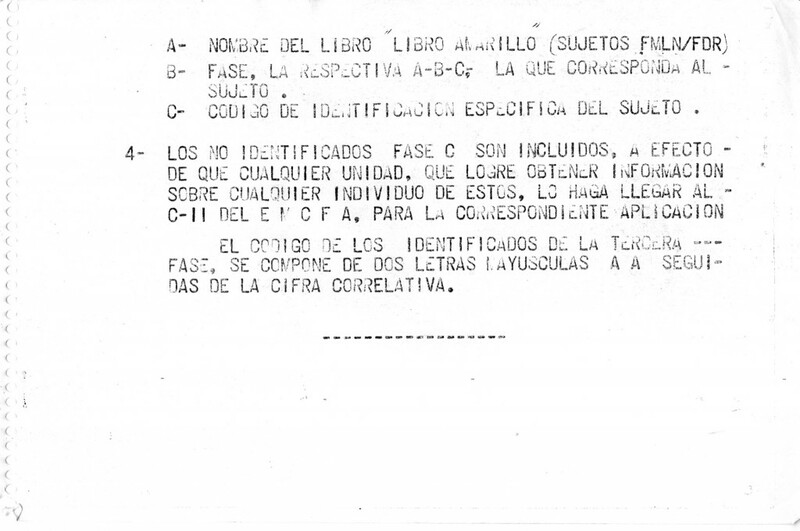 Nearly all list pages include a header with consistent elements: at left, the acronyms “E M C F A” and “SEDAG/ F143″; at center, the designation “Confidential” and the full title of the book; at right the code “Ref.C.AA06″ and a date. The majority of Phase B is dated 6 July 1987, with some pages dated 21 August 1987. The significance of the acronyms and codes (with the exception of EMCFA) is unknown, though they likely refer to an internal archiving system. Photo pages have no header elements. Photo pages consist of grids of 8 to 18 photos identified only by their respective alphanumeric codes. They include official identification photos as well as snapshots apparently taken during detention, some exhibiting possible signs of injury. While photo quality varies greatly, identifying features are visible in most photos. The “role or activity” column includes a wide variety of classifications. The most common label is “Militia” (590 citations); at least in some regions of El Salvador, guerrilla-organized militia were made up of volunteers trained in support roles and self-defense, with varying access to weaponry. “Combatant” is the second most common role (487 citations), followed by “Member” (380), “Political” (100), and “Collaborator” (71). More specific roles and activities are cited less frequently. 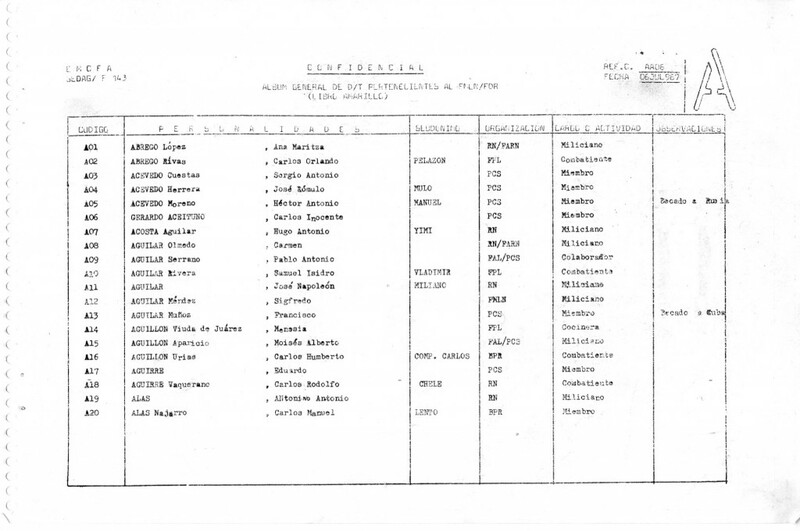 These include specific ranks and combat functions such as “Commander,” “Squad Chief,” and “Explosives Technician”; as well as civilian activities including “Unionist,” and “Catechist.” Several profiles are tagged as “Masas” – “the masses” – a term designating civilians presumed to be actual or possible supporters of the guerrilla organizations. 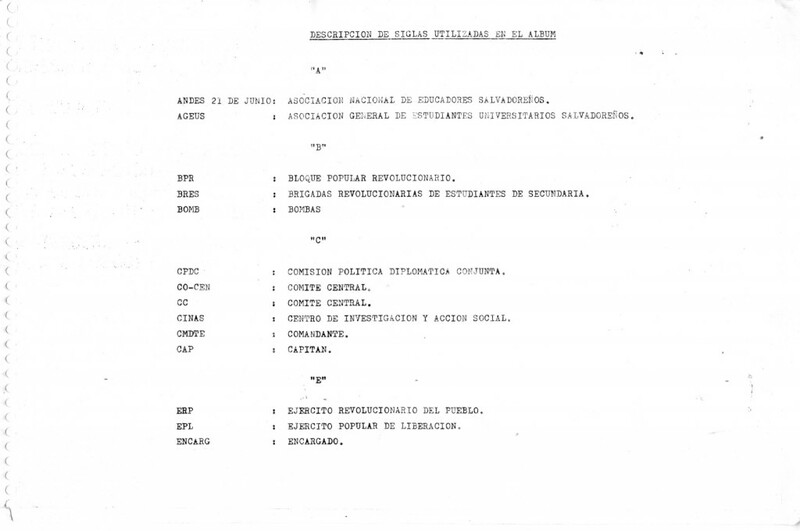 Notes in the “observations” column relate exclusively to individuals who received government amnesty (190 entries), or who traveled abroad or received scholarships in Communist-bloc countries, including Cuba, the USSR, Czechoslovakia, and Nicaragua. 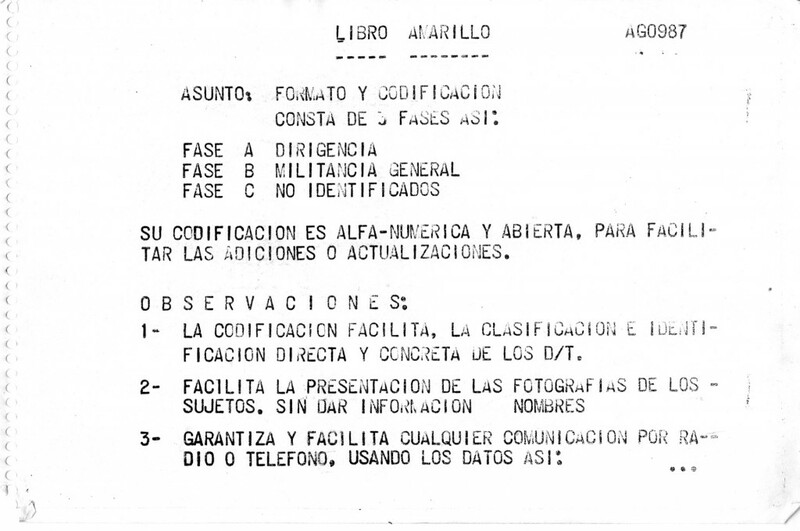 The Yellow Book’s conflation of legal and illegal organizations, as well as civilian and combat activities, reflects the national security doctrine of the Salvadoran military, which characterized all forms of political dissent as equally subversive, indiscriminately targeting suspected subversives and their family members and associates for repression. The following cases have been selected for additional analysis based on the willingness of survivors to contribute their reflections for this publication, as well as the availability of primary source documents regarding their cases. To contribute further information about any other individual profiled in the Yellow Book, please contact info@unfinishedsentences.org. María Teresa Hernández Saballos “H95″ – Academic and activist, disappeared Sept. 15 1979. Hector Bernabé Recinos “R32″ – Union leader, survivor of illegal detention, torture and disappearance of family members. 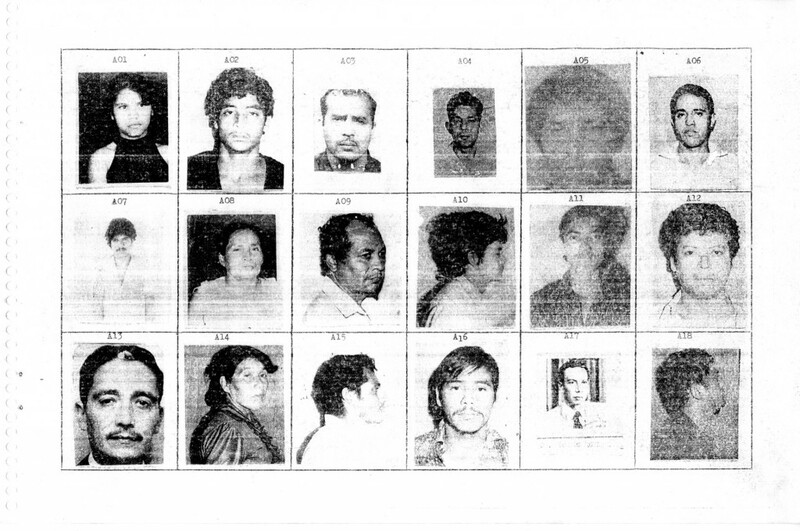 America Recinos “R133″ and ANDES 21 de junio – Mass arrest, illegal detention, and torture of political activists with the National Association of Salvadoran Educators. Phase C collects information on unidentified subjects, including pseudonyms, some identifying information, and photographs of each suspect. 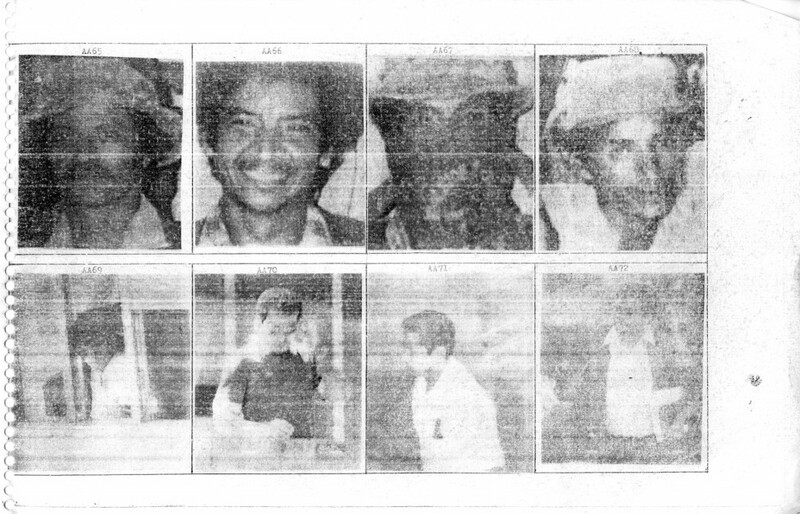 Of 87 entries in this phase, 45 are identified by pseudonyms and photos; the remaining 42 entries are identified only by photos, some with organizational affiliations. Some of the photos in Phase C indicate surveillance of subjects in public locations. The entirety of Phase C is dated August 1987. 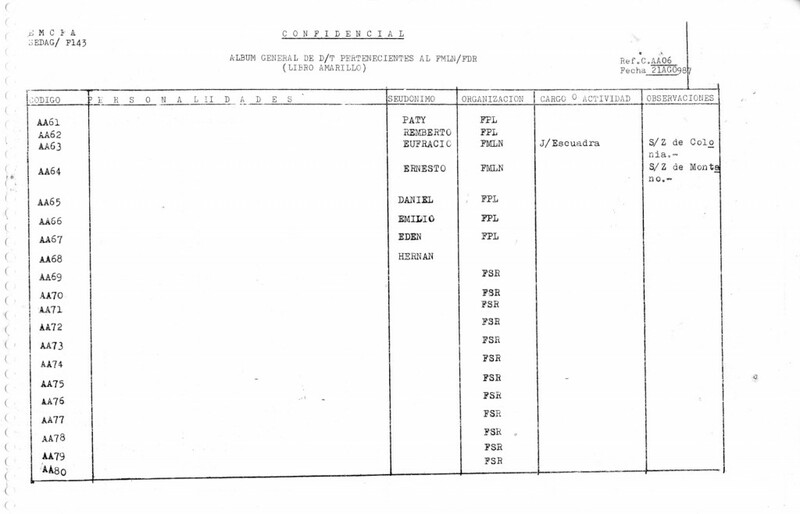 The organizational affiliation listed most frequently in Phase C, with 20 citations, is the Revolutionary Union Federation (Federación Sindical Revolucionaria, FSR); this organization is not cited in any other section of the Yellow Book, and none of its supposed affiliates are identified by name, suggesting it was an active surveillance target at the time the present version of the document was compiled.